A single answer is not to go out in the sun and if you do wear a sunscreen. I am the first person to admit that it is nice to enjoy the great outdoors, but if you can be sensible about it and use appropriate protection for your skin to combat the long term effects that the sun has on ageing and skin cancer. Apart from the usual rule of staying out of the sun from 10am to 3pm, it is vital to ensure that your sunscreen is giving you adequate protection against UVA and UVB rays. Look for sunscreens containing either zinc oxide or titanium dioxide. 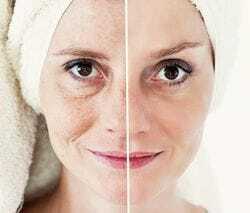 Skin ageing and how to prevent it. The more you crease the skin the more likely it is to form lines, and lines are a sign of ageing. You can liken the process to folding a piece of cardboard. A single fold barely puts a mark on the surface. Repeated folding leaves a permanent groove. The same process happens with facial skin and repetitive facial movements. The more movement there is, the more wrinkles there will be. The area around the eyes is particularly vulnerable as this skin is thinner and therefore creases more readily, a bit like tissue paper compared to the other skin on the face, which is thicker, more like cardboard. This is why eye creams won't get rid of your wrinkles, but Botolinum Toxin will. UVA rays are longer wavelengths of sunlight with a lower energy. They penetrate deeper into the skin targeting the structures such as collagen and elastin, producing the signs of ageing. Yes, your parents are important when it comes to ageing. There are intrinsic (internal) factors related to how cells age over time that are not fully understood by the medical community. These are inherited. Until recently it was thought that UVA was not involved in skin cancers. However, we now know that adequate protection against both UVA and UVB wavelengths of sunlight is required to prevent skin cancer and the premature ageing of the skin.